The seven Muslim-majority countries targeted in President Trump’s executive order on immigration were initially identified as “countries of concern” under the Obama administration. White House Press Secretary Sean Spicer on Sunday pointed to the Obama administration’s actions as the basis for their selection of the seven countries. Trump’s order bars citizens from Iraq, Syria, Iran, Libya, Somalia, Sudan and Yemen from entering the U.S. for the next 90 days. The 7th country – Lebanon – dodged a bullet, and Yemen replaced it. In the hours after its release, many questioned why the list omitted other countries with direct links to those terror attacks. The 9/11 hijackers were from Saudi Arabia, Egypt, the United Arab Emirates and Lebanon. Saudi Arabia – which is not on the list – is the world’s largest sponsor of radical Islamic terrorists. The Saudis have backed ISIS and many other brutal terrorist groups. And the most pro-ISIS tweets allegedly come from Saudi Arabia. Saudi Arabia is the hotbed of the most radical Muslim terrorists in the world: the Salafis (both ISIS and Al Qaeda are Salafis). And top American terrorism experts say that U.S. support for brutal and tyrannical countries in the Middle east – like Saudi Arabia – is one of the top motivators for Arab terrorists. 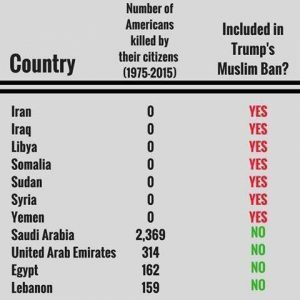 So whether you love or hate the idea of banning radical Islamic jihadis from the U.S. , the fact is that Trump – using a list compiled by Obama (in turn largely compiled by Neoconservatives pushing regime change 25 years ago) – is banning people from the wrong countries. Postscript: Admittedly, there are ISIS jihadis in Syria, Libya and Iraq. But they are only there because the U.S. and our allies created the conditions that allowed them to form and then metastasize. Neither ISIS nor Al Qaeda were in those countries before the Iraq and Libyan wars and the U.S. and its allies started supporting Syrian “rebels“. In all 3 countries, the governments hate the jihadis because the jihadis are fighting – and trying to bring down – the governments. This is the opposite of governments like Saudi Arabia which actively back terrorists. As for Iran, the CIA admits that the U.S. overthrew the moderate, suit-and-tie-wearing, Democratically-elected prime minister of Iran in 1953. He was overthrown because he had nationalized Iran’s oil, which had previously been controlled by BP and other Western oil companies. As part of that action, the CIA admits that it hired Iranians to pose as Communists and stage bombings in Iran in order to turn the country against its prime minister. If the U.S. hadn’t overthrown the moderate Iranian government, the fundamentalist Mullahs would have never taken over. And we’re busy creating a lot of new terrorists in Yemen.